NEW ORLEANS – Conference championships action across the NCAA Division I landscape created mass chaos in the women’s top-25 this week, as four of the top-five teams shifted spots in the National Team Rankings announced the U.S. Track & Field and Cross Country Coaches Association (USTFCCCA) on Monday. Georgia vaulted to the top spot in the rankings for just the second time in program history during the indoor season after finishing second at the SEC Indoor Championships this past weekend thanks to seven top-10 NCAA Division I Descending Order List marks hit at the meet in College Station, Texas. The Bulldogs were led by freshman sensation Lynna Irby, who ran the nation’s best 200 time this season at 22.66 in addition to posting a 50.62 in the 400, good for second on the Descending Order List and fourth in the collegiate record books. Despite claiming the SEC Indoor title, Arkansas slipped to second in the rankings. The Razorbacks’ Taliyah Brooks netted 4422 points in the pentathlon for an SEC title, putting her second on the Descending Order List this year. 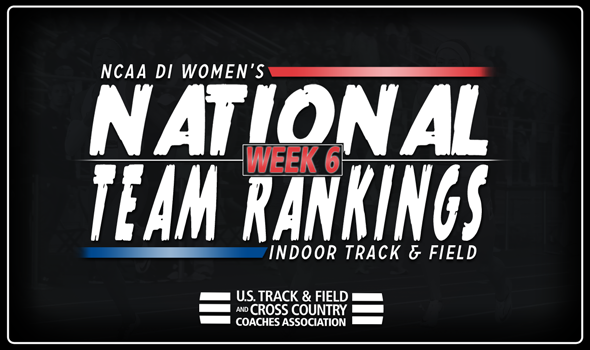 Kentucky held strong at third as the only team in the top-five that did not move on the week as two of its athletes put together historical performances. Like Georgia, the Wildcats benefitted from a stellar rookie in Sydney McLaughlin, who ran a 50.52 in the 400 for the top spot in the nation this year while also placing herself second in collegiate history. Olivia Gruver also notched the top pole vault mark in NCAA Division I this year at 4.67m (15-3¾) which doubles as the second-best mark in collegiate history. LSU found itself in the top-five for the first time this season after Mikiah Brisco and Kortnei Johnson ran 22.81 and 22.88, respectively, in the 200. Additionally, the Tigers’ 4×400 relay squad posted a time of 3:30.85, good for fourth on the Descending Order List. Southern California won the MPSF Indoor title, but still fell three spots to fifth. Oregon also fell out of the top-five after a third-place finish at the same meet, coming in at sixth on the week. Florida and New Mexico each boosted their spots in the rankings after solid outings. The Gators jumped to seventh after Yanis David posted the second-best triple jump mark in NCAA Division I this year at 14.11m (46-3½). The Lobos moved into the top-10 for the first time in program history by moving to eighth after its distance medley team ran the third-best time in NCAA Division I this season at 11:07.88. Rounding out the top-10 were Stanford and Texas A&M. Four teams saw huge boosts in the rankings outside of the top-10. Boise State leapt 29 spots to 14th, followed by a 56-spot jump by Clemson, which sits 17th. Florida State (58th to 22nd) and Louisville (60th to 25th) also made significant jumps. NOTE: This is the first time this season that the rankings are tabulated using data from only this season, including combined events. Prior to this week, previous season data had been used when it came to combined events only. It should also be mentioned that next week’s rankings will change as only declared and accepted entries to NCAAs will be scored. Finally, these are the final regional and #EventSquad rankings of the season.